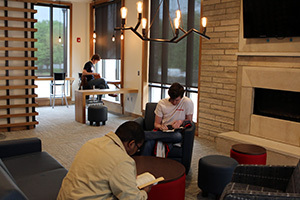 The new residential life district on the west side of campus is open and in use. The residence halls and townhouses opened for the spring 2016 semester and the lodges were ready for students to reside in this summer. The new housing is scoring rave reviews among current students living there and first-time visitors. It’s rare not to hear a “wow” or a “whoa” from the uninitiated. The amenities in the rooms are quite popular with the residents. The views should improve as the grass sprouts in time for the Class of 2020 to arrive and realize the full potential of the new housing district.